﻿﻿﻿﻿﻿Biologists battle golden alga and drought to produce hybrid striped bass. ﻿﻿﻿﻿﻿﻿If ever there was a fish that demonstrates the Texas Parks and Wildlife Department’s commitment to making fishing better in Texas, it’s the hybrid striped bass. Without the work of TPWD’s Inland Fisheries biologists and hatcheries, there would be no hybrid striped bass, usually referred to simply as hybrids, in Texas. Palmetto bass come by their name honestly. The cross was first produced in South Carolina — the real Palmetto State — in the 1960s. Hybrid production and stocking began in Texas in 1972, when a test run of 1,800 fish was produced. Numbers quickly climbed in future years, topping 1 million in 1977 and ranging from 2 million to 4 million in most years since then. Two of Texas’ five freshwater hatcheries, Dundee and Possum Kingdom, produced most of those fish. Eggs in a hatching jar. And then came golden alga and drought, with a couple of floods thrown in. Golden alga is a microscopic killer that periodically blooms in some Texas waters, producing a toxin that basically smothers gill-breathing organisms like fish and mussels. In 2001 golden alga totally wiped out production at the Dundee hatchery. The Possum Kingdom hatchery was off-line at the time because of construction. Fingerling production rebounded in 2002 and reached an all-time high of more than 8 million in 2010, but then came the drought of 2011, and Dundee lost its water supply. Possum Kingdom, meantime, had been struggling with golden alga. Produc­tion fell to just 1.3 million fingerlings in 2011. TPWD biologists had been busy developing pond management strategies to control golden alga with moderate success, but no one can control Texas weather. Striped bass broodfish are collected annually below the Lake Living­ston dam, and in 2012 flooding prevented the timely collection of broodfish. Hybrid production plummeted again, to just 6,605 fingerlings. ﻿Eggs from female striped bass and milt from male white bass are stirred with a turkey feather to ensure all the eggs are fertilized. Biologists refused to accept defeat. Dale Lyon, manager of the Possum Kingdom hatchery, and the late Dennis Smith, former manager at Dundee, worked to develop ways to successfully raise fish despite golden alga. Doing this requires a delicate juggling act, Kurten says. Using just the right amount of ammonium sulfate to kill golden alga is so unpredictable and challenging that TPWD looked for another way to subdue the killer. 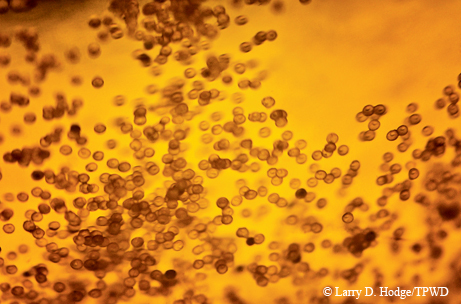 Sterilizing incoming water using ozone eliminates golden alga. In the meantime, Dundee has no water and no ozonation system, and the availability of broodfish from Lake Livingston can’t be counted on, so what can be done? 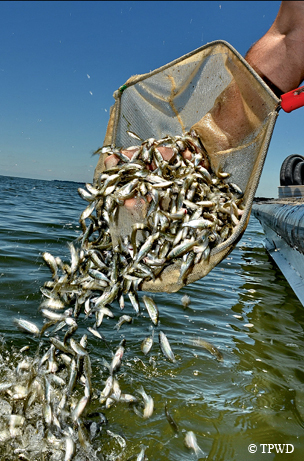 ﻿﻿Because hybrid fingerlings must be stocked into locations without predator fish, they are taken to suitable locations on the lake and stocked by hand from dip nets. Because floods prevent broodfish collection below Lake Livingston every 10 years on average, TPWD is also developing a captive broodfish program at the Possum Kingdom hatchery. Spawning wild fish in a hatchery is an intricate dance with nature that requires careful timing, constant vigilance and intimate knowledge of how the process works in the wild and how to replicate that process — plus a bit of luck. It’s a tricky process. “Since the collection of broodfish is limited to a short natural spawning window, if you blow it the first time, it may be too late to collect broodfish and spawn again,” Kurten says. When all works well, fisheries crews use electrofishing boats to collect female striped bass from below the Lake Livingston dam and white bass males from East Texas rivers. The future parents are taken to the hatchery, where females are observed carefully to gauge their readiness to spawn. At the collection site and periodically at the hatcheries, a glass tube is inserted into females’ vents and egg samples are taken for viewing under a microscope to determine their stage of development. Color-coded tags are used to mark fish as being ready to spawn in two hours, four hours and so on. Spawning begins when the first female is ready and continues until all have been spawned, usually 24 to 30 hours later. Eggs from the females are mixed with milt from the males in a container with a small amount of water and stirred with a turkey feather for about 30 seconds. Fertilized eggs are put into hatching jars to incubate for 48 to 72 hours. During this time they must be constantly watched to be sure water flow and temperature are optimal; there must be enough water flow to keep the eggs suspended and gently rolling, and the water temperature needs to be maintained between 64 and 66 degrees Fahrenheit. Fry are collected and moved to holding tanks before being stocked. Since hybrid fry are very sensitive to light, they must be stocked into the outdoor rearing ponds at night, usually from about 10 p.m. until just before first light. To produce the microscopic plankton the fry feed on, ponds are filled and fertilized with cottonseed meal on a strict schedule. Pond pH is closely monitored, because fertilization is a double-edged sword. The challenge is to keep the ravenous little fish fed and growing without the digestive byproducts of their food killing them. It’s a constant battle. After a few weeks in the rearing ponds, the fingerlings will have grown to approximately 1.5 inches long and will be ready to take the ride to their new home in a lake. They are still so sensitive to light that they will go into shock if suddenly exposed to direct sunlight, so pond harvesting is done before sunup. When the hauling trailers arrive at the stocking site, compartment lids are opened slowly. To acclimate the fish to their future home, water in the hauling tanks is drained and replaced with lake water about a quarter of a tank at a time. Hybrids differ from largemouth bass in that they are an open-water species. Rather than living close to vegetation, stumps or other structure in a lake, they roam the open waters of the lake like mini-wolf packs, looking for small baitfish. District biologist Richard Ott describes what he looks for when stocking hybrids. While TPWD biologists have been able to devise work-arounds for some of the obstacles to producing hybrids, they’re not home-free. It would seem that hybrids are the bobwhite quail of fish, vulnerable to lethal agents and dependent on just the right conditions to reproduce. Now they have one more threat to cope with: zebra mussels. 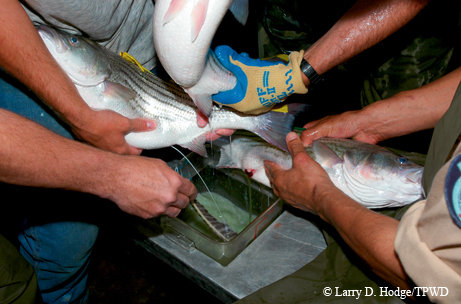 So why, if producing hybrid striped bass is so difficult, does TPWD continue to do so? To answer that question, just put a hybrid on one end of a fishing line and yourself on the other. Then you’ll know. You don’t go fishing for hybrids; you go fishing to catch hybrids. The fact that they roam lakes in schools and feed aggressively means that when you locate them and they are ready to eat, they will bite almost anything you throw at them. Hybrids tend to be in shallow water early in the day, since that’s where shad and other baitfish spend the night. Topwater lures tossed up near the bank can bring explosive strikes. As balls of baitfish move into open water, hybrids lurk beneath, slashing into the mass of fish, which may fly out of the water trying to escape. Seagulls and other birds join in the action, and anglers use binoculars to spot “working birds” diving into the water to snag their share. Maneuvering close to a top-water feeding frenzy and throwing a Rat-L-Trap or buzzbait or almost anything will lead to vicious strikes. Later in the day the baitfish head deeper, and the hybrids are close behind. Anglers switch to slabs or 4- or 5-inch Sassy Shad plastics and fish straight down, jigging the bait up and down. Often the strike will come as the lure falls through the ball of baitfish to the waiting hybrids below. For more information on hybrid striped bass and where to fish for them, see www.tpwd.state.tx.us/fishboat/fish/.